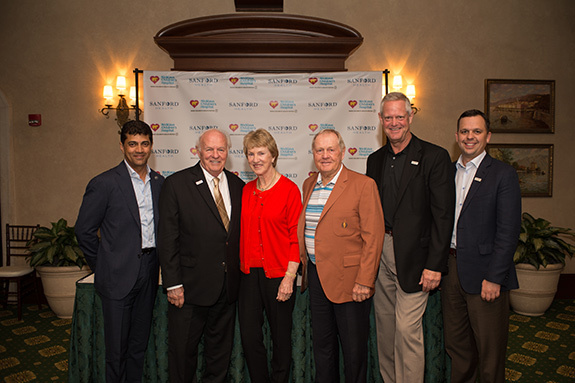 Dr. Narendra Kini, CEO of Miami Children’s Health System; Denny Sanford, philanthropist; Barbara and Jack Nicklaus, co-founders of the Nicklaus Children’s Health Care Foundation; Kelby Krabbenhoft, President and CEO of Sanford Health; Nate White, Chief Operating Officer of Sanford Health (left to right). Sanford Health and Nicklaus Children’s Hospital will sequence the genes of nearly 1,000 Latino and Hispanic people in an effort to better understand the health needs of those populations. To launch the project, philanthropist Denny Sanford and Sanford Health have jointly given $7 million to the Nicklaus Children’s Personalized Medicine Initiative in Miami. The project is among the many innovative efforts underway at the 289-bed Nicklaus Children’s Hospital, flagship of the Miami Children’s Health System. Founded in 1950, the hospital was rebranded with the Nicklaus name in 2015 in honor of golf icon Jack Nicklaus and his wife, Barbara, and in appreciation of the generous support of the Nicklaus Children’s Health Care Foundation. The Foundation was created by the Nicklaus family in 2004 to support world-class children’s healthcare in South Florida and nationwide. Genomic medicine focuses on the use of genetic and genomic information to personalize care, in this case, for children. For example, doctors can help determine which therapies or medications work better for individuals once they have some genetic information. It allows physicians to improve treatment outcomes by better understanding the individual characteristics of each patient. The money will help sequence the genes of Hispanic or Latino pediatric patients and their families. Once the sequencing is done, it will be easier to characterize gene variances and what they mean – including someone’s predisposition to a certain disease or how they might respond to a particular medication. The information can help build a database of common genomes in underrepresented populations and also look for rare diseases. That will allow researchers to identify genetic patterns among Hispanic and Latino populations, currently a significant gap in genomic medicine. MCHS is South Florida’s only health care system exclusively for children and includes the nonprofit Nicklaus Children’s Hospital; Miami Children’s Health Foundation, the organization’s 501(c)3 fundraising arm; Miami Children’s Research Institute; a network of 10 nonprofit outpatient centers situated in Miami-Dade, Broward and Palm Beach counties; Pediatric Specialists of America, a nonprofit physician practice subsidiary; a management services organization; and an ambulatory surgery center. Nicklaus Children’s Hospital is home to the largest pediatric teaching program in the southeastern United States. Sanford Health integrates genetic and genomic medicine into care plans for children, adults, individuals with a cancer diagnosis, and patients with many other conditions. In 2014, a $125 million gift from Denny Sanford created Sanford Imagenetics, a first-of-its-kind program that uses genomic medicine to personalize and more effectively deliver primary care for adults. Sanford physicians and researchers also are tailoring treatments based on genetic information for patients who have a variety of diseases, including breast cancer, head and neck cancers, pediatric cancers and heart disease. Genetic counselors – professionals who explore family medical history to better understand inherited conditions – are embedded in clinics across Sanford to educate families. As the country’s preeminent health care philanthropist, Denny Sanford has given close to $1 billion to Sanford Health in less than two decades. His generosity has spanned almost every area of care, including children’s health, research, breast health and genetics. Founded in 1950 by Variety Clubs International, Nicklaus Children’s Hospital—part of Miami Children’s Health System—is South Florida’s only licensed specialty hospital exclusively for children, with more than 740 attending physicians and over 220 pediatric subspecialists. The 289-bed hospital is renowned for excellence in all aspects of pediatric medicine with several specialty programs ranked among the best in the nation in every year between 2008 and 2017 by U.S. News & World Report. The hospital is also home to the largest pediatric teaching program in the southeastern United States and has been designated an American Nurses Credentialing Center (ANCC) Magnet facility, the nursing profession’s most prestigious institutional honor. For more information, visit nicklauschildrens.org.